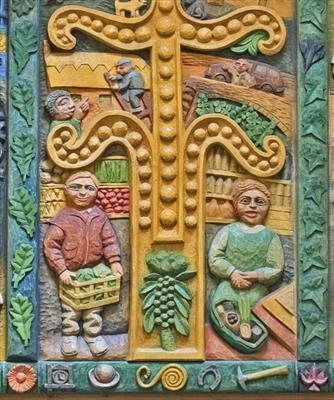 On the carved stone font in the local church there are images of the Tree of Life and of Adam and Eve. The keepers of the local shop stand in as the modern Adam and Eve for 1990s Hook Norton. I also appear in the top right of this detail, as the figure standing in front of a brown painted car, my first Vauxhall Astra Estate!